Thisstory was updated at 12:24 p.m. EDT. AstronautJose Hernandez has comea long way, and now he's about to go even farther. Hernandez,a man who spent much of his childhood picking strawberries and cucumbers withhis Mexican migrant farming family, is poised to make his firsttrip into space next week when NASA?s shuttle Discovery launches toward theInternational Space Station. Liftoff is set for 1:36 a.m. EDT (0536 GMT) onTuesday. "Icome from a very humble family and what I would call a typical migrant farmworking family," Hernandez said in a NASA interview. He described hisupcoming flight as "the culmination of a dream, you know, in terms of whatI?ve been working towards with the support of my family and my parents, and tome it?s something that?s going to be incredible." It?s also amajor event in Mexico, where his family hails from the state of Michoac?n. On Saturday, MexicanPresident Felipe Calderon called Hernandez to congratulate on his upcomingmission and invited him to dinner when he gets back to Earth, according to theAssociated Press. TheAssociated Press reported that Hernandez accepted Calderon?s invitation todinner and a chat about space, and offered to serve as an advisor for a futureMexican space agency. ForHernandez, 47, the dream to reach space was planted at a young age even thoughhe didn?t learn English until he was 12 years old. He remembers the exactmoment, in fact, when he was a high school senior and heard the news that the firstHispanic-American had been chosen to travel into space. "I washoeing a row of sugar beets in a field near Stockton, California, and I heardon my transistor radio that Franklin Chang-Diaz had been selected for theastronaut corps," he said. "I was already interested in science andengineering, but that was the moment I said, 'I want to fly in space.' Andthat's something I've been striving for each day since then." Hernandezwas born in French Camp, Calif., to parents from the central Mexican city of LaPiedad in Michoac?n. Everyyear he and his family would travel from Mexico to southern California inMarch, then northward to the Stockton area by November, working at farms alongthe route. They would return to Mexico for Christmas and then start the cycleall over again in the spring. "It?sthe only life I knew and it was typical," Hernandez said. "I thinkthe only atypical portion of that whole story was the fact that my parents puta lot of emphasis in education in spite of them only having a third gradeelementary school education. During the school year, Monday through Friday,they would put us in school, and there was a lot of families that wouldtypically pull the kids out of school just so they could help with thehousehold income." Hernandezdid well in school and went on to college, after which he worked as an engineerat Lawrence Livermore National Laboratory, and took a break to earn a Master'sdegree in electrical engineering from the University of California, SantaBarbara. 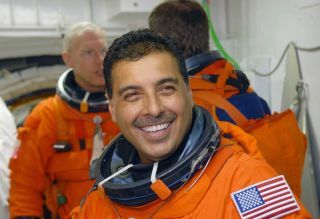 Hernandezbegan working as an engineer for NASA?s Johnson Space Center in Houston, whereastronauts train, in 2001. He appliedfor 12 straight years to become a NASA astronaut before finally being selectedfor the corps in 2004,and credited his parents' support and focus on education for helping himachieve his dream. "It'sa feel good story, but it's not a story to tell because, 'Hey, look at me, I?man astronaut. Look how good I am,'" he said. "It?s more of a story totell so that the folks that are listening and viewing this can say, 'Hey, if hewas able to do it, why can?t I do it?' So that?s what I?m hoping to do is toempower especially the Latino community, the Latino students." Hernandezis married to wife Adela, who runs a restaurant near the Johnson Space Centercalled Tierra Luna Grill, which is Spanish for Earth Moon Grill. They have fivechildren: three daughters, ages 10, 12 and 13, and two sons, ages 6 and 15. As part ofhis efforts to reach out to the public, especially young people, Hernandezrecently began writing about his experiences training for the mission on the microblogging siteTwitter. He posts updates in English and in Spanish under the name "@Astro_Jose." "Ihope to spread that excitement about space, science and engineering and inspireothers to follow their dreams by sharing my activities and interacting with myfollowers on Twitter," Hernandez said. He joins agrowing crowd of astronauts who are posting to the site, including STS-127commander Mark Polanskyin July and Hubble Space Telescope repairman Mike Massimino, the first personto "tweet" from space.